Under Construction! Much more to Come Soon! Many articles in this section will be taken from out of print magazines or books, post copy write expiration. In addition, we're collection various texts from recent sources. Appropriate credits will be posted within the article section, if anyone has any concern with a published article please let us know ASAP! Our intent is educational, and obviously we're not charging for access to this section. If you have a text you'd like to contribute, either your own or a third party resource, please contact us and we'll be happy to review it. Articles are often the foundation of knowledge transfer. They are short, sweet, and to the point on a specific subject and take far less exhaustive efforts to publish than books or even papers. Artisans, both Stan & Eric, are active authors publishing articles on woodworking, antiques, history, and technical articles from Stanley's past life in personnel and Eric's Information Technology career. We plan to build this section on a foundation of eclectic articles discussing any topic related to woodworking, antiques, or Early American life. "Restoration of the Game." 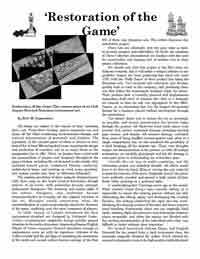 - Published July 2003 in the Chess Collectors International Newsletter. The article details the restoration, and before and after shots of an 1849 Howard Staunton tournament chess set by Jaques of London. 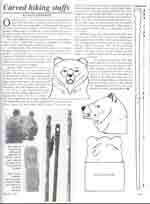 Character Staffs: A feature article on www.customwalkingsticks.com provides a unique profile on walking sticks by Stanley D. Saperstein. Artisans Tri-Fold Brochure offers a printable perspective on our work.